John Scales Avery received a B.Sc. in theoretical physics from MIT and an M.Sc. from the University of Chicago. He later studied theoretical chemistry at the University of London, and was awarded a Ph.D. there in 1965. He is now Lektor Emeritus, Associate Professor, at the Department of Chemistry, University of Copenhagen. Since 1990 he has been the Contact Person in Denmark for Pugwash Conferences on Science and World Affairs. Member of the Danish Peace Commission of 1998. Technical Advisor, World Health Organization, Regional Office for Europe (1988- 1997). Chairman of the Danish Peace Academy, April 2004-. You’ll find a lot about this eminent scholar at Wikipedia. Avery is also a leading peace researcher and activist – “Since 1990, Avery has been the Contact Person for Denmark the Pugwash Conferences on Science and World Affairs. In 1995, Avery was part of a group that shared in the Nobel Peace Prize for their work in the 1990s in organizing the Pugwash Conferences on Science and World Affairs. 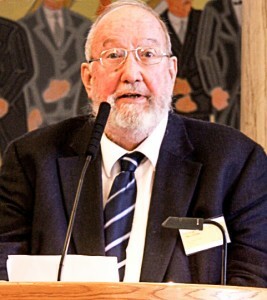 In 1998, Avery was elected to the Danish Peace Commission. During the years 1988-97, Avery was the Technical Advisor at the World Health Organization, Regional Office for Europe. In 2004, Avery became the Chairman of the Danish Peace Academy. In his usual humble and plain style John tells the story of his life – his personal life, his scholarly life and his peace life – here. Dr. Avery seems to have ben writing day and night throughout his life – here is his amazing list of books, chapters and articles on world affairs. In early 2016, Irene Publishing – run by TFF Associates Jørgen Johansen and Majken Jul Sørensen – published Avery’s Collected Essays as well as The Need For A New Economic System. John joined TFF as TFF Associate in March 2016.